OK- so I am not really sure that “the sh*t just got real” thing works in this context– I just really wanted an excuse to say that. But, if it means that I need to really get my rear in gear– or my submission date is looming (September 29!!!) and I still do not have a full first draft… then yeah, sh*t just got real! (I tried typing it without the asterisk but couldn’t bring myself to leave it like that– I’ve got me some scruples, or I’m just an ol’ fuddy-duddy academic desperately grasping, and failing, to come off as edgy). Because of my very full teaching schedule, today is the first day in months that I actually have the day (full work day) to write/work and of course, with that kind of freedom comes some trepidation– now I really have to do something. I am trying to go in with beginners mind— really just being present to what I am writing now and trying to not get ahead of myself or panic about all the work I haven’t done yet. I am coupling that with a plan– mapping out what needs to be done. Got the white board wiped clean, new calendar pages ready to be filled in. I am walking into the white room à la Twyla Tharp, ready to work, with a plan but open to surprises. And by surprises, I mean brilliant strokes of genius! Divine inspiration! It’s real. 163 days… and counting. Let’s get this sh*t done!!! Everyday I wake up with the intension of having this kind of day– one where I am “learning at the edge of what I already know”– I needed this, need these kind of goals working to have more days with “sustained flowing, thinking and writing/talking over time”– except in my PhD work I am alone much of the time so much of the talking with have to be to myself! 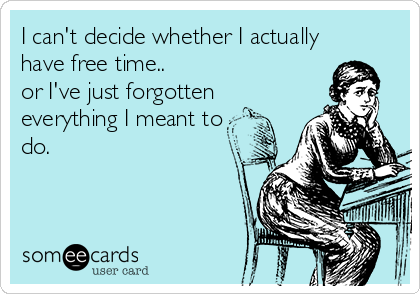 I get all caught up in my “habitual self”– which helps me get what I need to get done to actually sit down at my desk, but I was failing to see that I need to break free from this “habitual self” once I’ve sat done… Hmmmm…. I’ve been dipping in and out of a rather pleasurable book about writing. Most people read books about writing for utilitarian reasons – to find a new technique, to see something that might inform their own work, to seek explanations for particular conventions. And so on.There’s absolutely nothing wrong with these kinds of informative writing books – I write them myself so I’m quite glad people want to read them. And I buy and read other people’s informative writing books so that I can add to what I know, and perhaps challenge some of the ways I think about things. This year- I am home for Mother’s Day- but I leave for another PhD trip in just a couple of weeks… this time I will be gone three weeks, total. I have to fly out on my daughter’s birthday and I will miss my youngest son’s birthday. It is always something. I work hard to schedule around school concerts, graduations, First Communions, but with six kids I miss something “important” on every trip. It doesn’t get easier being away, in fact I would say it gets harder with every time I get on a plane. Sure, I am more organized, and maybe even the household runs much more smoothly when I am away now, compared to when I started three years ago. They’ve got it figured out, but the missing them all like crazy? I don’t think I will ever figure that out. As much as I tried to talk myself into believing that this was just going to be another day, I woke up feeling very aware that it is, (at home, not here) Mother’s Day, and that being 7,500 kms away from my own mum and 5,000 kms away from my kids, stinks. People often say things to me like, “Six kids! You must get spoiled rotten on Mother’s day!” but we’ve always happily rejected the “send Mom to the spa for the day” or “lavish Mom with jewelry” type of celebration. At our house it is always low key, and always includes things like, sweetly made crepe paper tulips or a carefully cut out construction paper card in the shape of a tea pot with a real tea bag tapped inside, sometimes there are flowers, and there is always a special meal (cooked by me, because, not to toot my own horn, but I am the best cook in the house), shared around the table with my old man on one end, me on the other, three of them to the right of me and three to my left. But today, not to sound like too much of a Debbie-downer, there will be none of that. As I sat having my coffee in front of the “telly” this morning contemplating that maybe I “deserved” a little “me time” and rolling up into a ball on the couch to watch a marathon of British gardening shows, seemed, momentarily, like a really good plan, I knew, in order to nip this pity party in the bud I needed to get up and get moving, or else, my whole reason, for being so far away from my family would all be for naught. I decided to go for a run along Birmingham’s Canal to clear my head and get my academic mojo flowing. A few minutes into my run, and what do I see swimming right alongside me the edge of the water? A Canadian Goose with her six sweet and fluffy goslings swimming behind her! (I am not making this up!) So, somehow in my fragile emotional state, I thought it would be a good idea to lean in for a closer look, thinking she too would be excited to see ME, a fellow Canadian and Mother! We would smile knowingly at one another, maybe share a few Mama-Goose comments like, “you’ve got your hands full!” or “enjoy, in blink of an eye they will be all grown up” but instead, she gave me one of those violent, demonic “back off crazy lady!” hisses and hurried her chicks away from me. I get it. I was a new Mom once too, and let me tell you, Goosey-Goosey Gander, you will loosen up and you will relax. With #1 I was reluctant to let anyone near him, let alone touch him, and by #6 I was pretty much tossing him at everyone and anyone who I thought may be able to complete the pass just so I could have a few minutes of peace. But today, as I turned to continue trudging along the canal I realized that for this Mother Goose, there nothing I wouldn’t do today to hang on to each and every one of my fluffy little goslings just a little longer. Happy Mother’s Day. There was one of those Facebook posts going around not too long ago that said something like this; “Optimist: Someone who figures that taking a step backward after taking a step forward is not a disaster, it’s a cha-cha.” (I later found out the quote is attributed to author Robert Brault) And at the time I took it in with a grain of salt as I do any words of wisdom imparted on social media- but I reminded myself of those words last week as I lay in a crumpled heap on the floor of my yoga class, whispering to the teacher “I’m OK!” after hearing something go “pop” in the general area of my left hip and bullock and my leg just kind of giving out. I lay there trying to get myself together with tears of self pity running down my face- not so much for the pain but because I was immediately mad for this happening and at myself for having the thought “Man, I am on an exercise toll!” just before the class started. I basically spent the last week feeling poopy. Limping, when I tried to walk but in more pain when I was sitting to long. So really, pretty useless. 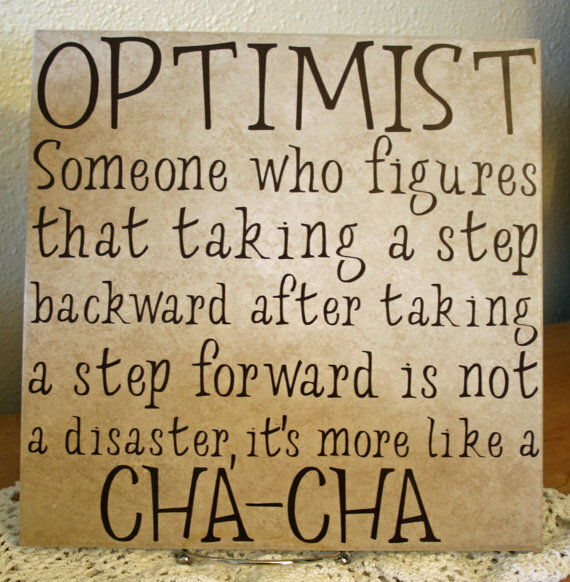 I have been feeling frustrated, bummed out, irritated and restless, and none of it has felt like a cha-cha. bout Harriet Thompson, the 92 year old American woman who just ran her sixteenth marathon and broke the world’s record for being the oldest woman to do so. I am a bit obsessed with stories about awesome old women, I am constantly on the look out for stories like Harriette’s and I find myself studying them in the hopes of being able to figure out what their secrets are for being so fabulous for so long! The thing that pretty much rings true with all the women I have read about is an optimistic outlook, that and perseverance. And with that revelation I cued the band to play a cha-cha and lead myself to the dance floor. I finally went to see an osteopath today (for the first time) and I am feeling considerably better already. I won’t be running today, and maybe not even tomorrow, but I am pretty determined to be running when I am 92.